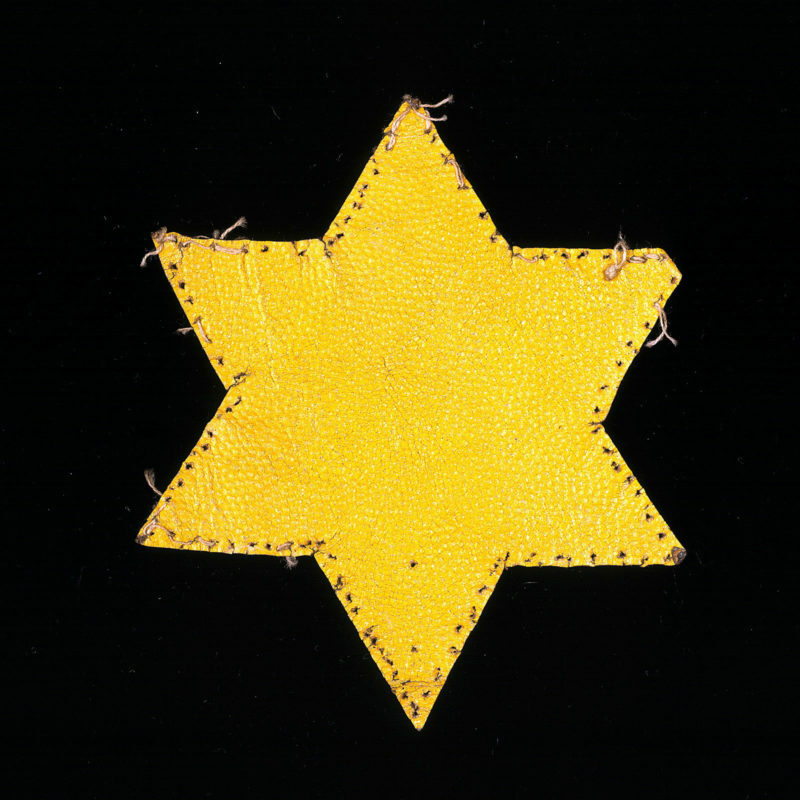 April 5, 1944: Under German guidance, Hungarian authorities require all Jews in Hungary to wear the yellow star. This order was one of the first of hundreds passed after the Nazi occupation of Hungary in March 1944 in order to gradually deprive Hungarian Jewish citizens of their civilian and human rights. These laws enabled the murder of approximately 600,000 people, mostly Jews, from the greater area of Hungary. I did some research to find personal memories about what it felt like to wear the yellow star. On the Centropa website I read a woman’s recollection of that time. Zsuzsa – who was thirteen years old in 1944 – recalled that a non-Jewish friend of her mother’s brought a peculiar present to the family after the yellow star decree in Hungary. 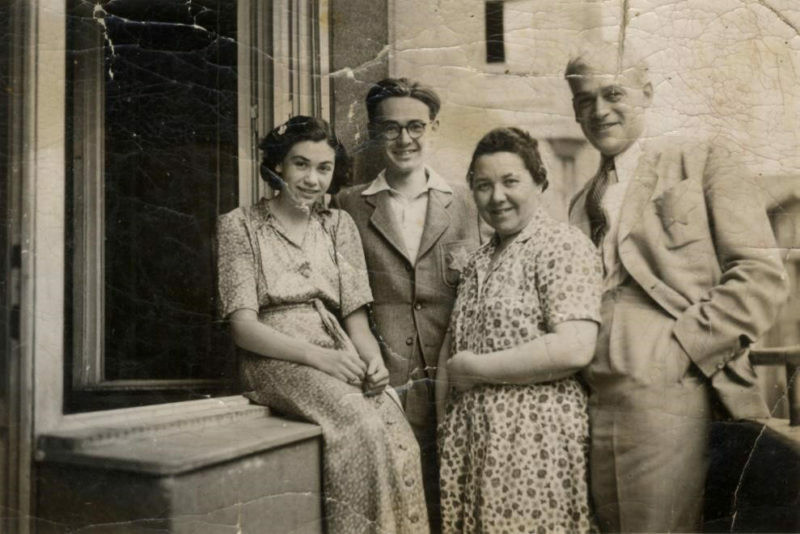 This family friend used to work in the Budapest Stockings Factory that had started to produce “hundreds of thousands yellow stars” to meet the “needs.” This family friend showed up at Zsuzsa’s house, and as if it were a bouquet of flowers, she handed over a box of yellow stars to Zsuzsa’s mother. She was sincerely excited about the gift, talking about how great the colors and shapes of these yellow badges were. She was thrilled that by giving this gift, Zsuzsa’s family would not have to spend any money to buy the mandated stars. The irony of the story, as Zsuzsa summed up, was that this “probably not so clever” friend had truly good intentions in bringing the peculiar present. She probably did not understand that wearing the yellow star would soon cause situations of “painful and unnecessary shaming,” as Zsuzsa called it. Zsusa’s story shows how Jews and non-Jews accepted this law – and how Jews continued to live with dignity and integrity for as long as was possible. Similar thoughts occur to me when I see photos of Jews wearing the yellow star. The photo below that I found at Fortepan, Hungary’s largest community-based photo archive, is a good example of that. 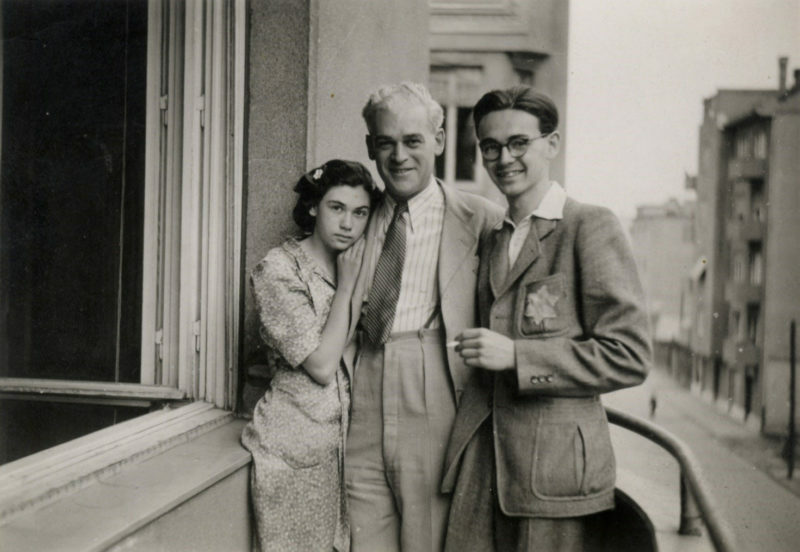 In another photo of the same family, the father and son are smiling, but signs of worry occupy the face of the young woman. What were they thinking about? My grandmother was 17 in 1944. She was learning to become a seamstress in Budapest, far from her family who lived in the country. She told me that she took off the yellow star on her clothes and escaped from the ghetto. Her sewing skills made her confident she would leave no sign of the removed star on her dress – and that, if necessary, she could sew the star back on. She received false papers from her cousin who was involved with the illegal communist movement. Eventually, my grandmother was arrested and forced to march with thousands of other Jews towards Austria some time during the last months of the war. Just as she had the courage to take off the star, she was also brave and sober enough to escape from the march with a friend, hide in desolate granaries, travel on stranger’s farm-car and eventually get on a train back to Budapest and go into hiding. While April 5th has never been an official memorial day in Hungary, the 4th of April used to be celebrated during communism as the Day of Liberation, commemorating that the last German soldier left Hungary that day in 1945. Today historians are seeking the proper words to describe the complex realities of Hungary’s being both liberated and occupied by the Soviet Army, but it is not my intention to decide that debate. I’d rather emphasize the importance of not acting as naïve as Zsuzsa’s mother’s friend when we face discrimination, and of finding the courage to take off the star, just like my grandmother, or that young Russian soldier. Eszter Susán is a Museum of Jewish Heritage Prins Fellow. The full interview with Zsuzsa can be read in Hungarian at https://www.centropa.org/hu/biography/dosai-istvanne.